Are you trying to erase a USB drive on your mac but getting this error as soon as you insert it? 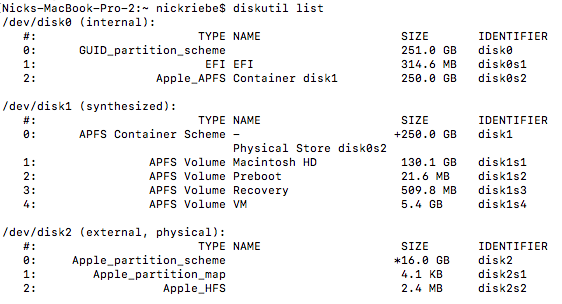 That might be because the disk is a Windows/Linux bootable formatted as FAT-32, which OSX cannot read. And then when you try to erase in disk utility, the USB is greyed out and First Aid doesn’t work, you can’t repair it, and you can’t mount or unmount it. Thankfully I ended up fixing it quickly (with a little googleing). And <disk identifier> is the ID of your disk. DO NOT MESS THIS UP. And the result: Finished erase! Let me know if this was helpful in the comments. keep getting that error. This is a FW external G-tech drive that always worked as backup. Thank you Nick… want a good laugh? I was using a power pack plus that was rated at a lower amperages than the G-drive was rated… I have so many orphaned power adapters. so I found what I thought was the right one. it worked for a while, then it stopped.. checked again.. yet again the wrong average amount… I was so paranoid abut polarity I hadn’t checked the amperage.. FINALLY found the right adapter, the drive worked flawlessly! Tried doing this but I keep getting “Unable to write to the last block of the device”. I get Error: -69877: Couldn’t open device. As you can see, I get another error message with error -69760. Hi Scott – sorry this is happening to you! I took a quick read here, and some things suggested are: try another port, try another cable, or try another computer. Those are the only suggestions I have, as I’m not an expert…just someone who got it working for themselves and wanted to share. Thank you very much it worked as stated.